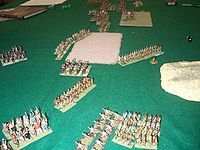 Miniature wargames are a form of wargaming designed to incorporate miniatures or figurines into play, which was invented at the beginning of the 19th century in Prussia. The miniatures used represent troops or vehicles (such as tanks, chariots, aircraft, ships, etc.). The games may reflect historical situations and armies, or may be futuristic or fantasy-based. 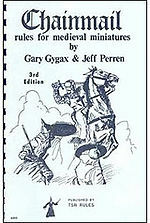 This list compiles published miniature wargames categorized by their subject matter, genre, or time period covered in their rules. Where known, the publisher is given (or, in a few cases, the designer(s) in the case of self-published or freely distributed games), as well as the date of first publication (many games have been published in several updated editions). 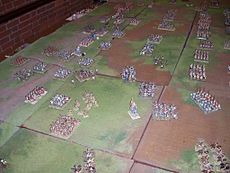 A game in play using the Warhammer Ancient Battles ruleset. Don't Give Up The Ship! 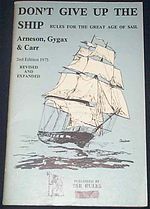 Rulebook (1975). 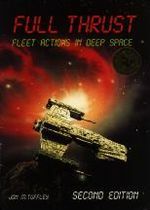 Science versus Pluck, or "Too Much for the Mahdi"
Second Edition Full Thrust Rulebook.